It’s almost mid-September, we have a mere 51 days till Halloween, seasonal merchandise is flooding local shops, and I have received a free gift from Freddy in Space, courtesy of Vultra Video. It was a simple contest. Make a comment on the Freddy in Space blog and receive an entry. The prize? 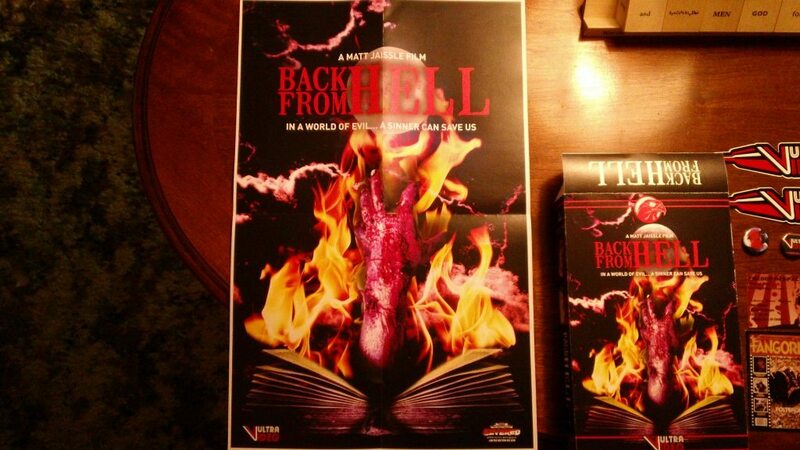 A copy of the sold out, limited edition VHS, Back From Hell. This particular movie was sold exclusively at a small convention called Severed Sinema. The hell of it? This particular event is held 15 minutes away from where I live, and I didn’t go. Severed Sinema used to be a monthly horror movie marathon, showing cult classics and b-horror flicks (usually two or three) on the big screen with a music or art intermission for a measly five bucks. I attended these regularly. After a while, the people in charge decided to make Severed Sinema a twice yearly event instead. No longer would they show horror movie marathons. Gone were the long nights of popcorn and beer alongside like-minded horror fans. Now, Severed Sinema holds two major events per year. One during the summer months (this year was an amateur horror film festival plus tape trading convention) and one in October (usually a zombie walk plus airing of Rocky Horror Picture Show). These are great events, of course. I attended the Rocky Horror event once, a couple years ago, and it was a blast. Still, I miss the days when every month held horrific possibilities. But I’ve gone off the rails. 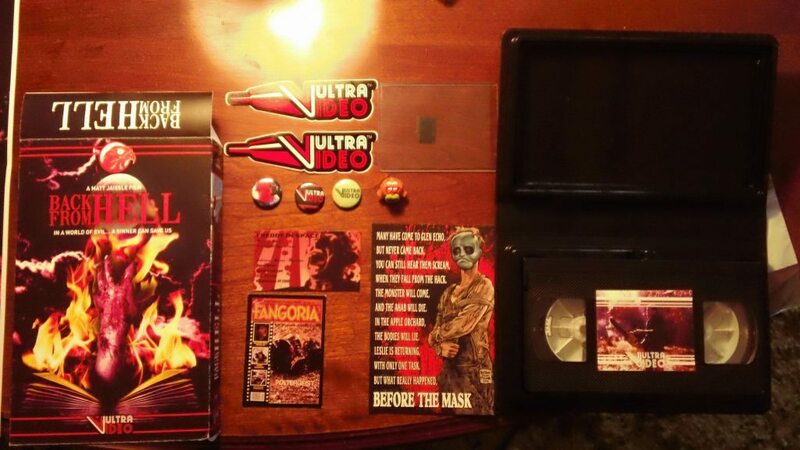 I’m here because even though I missed the Tape Trading Convention that was held a mere 15 minutes away, through the use of some kind of cosmic, miracle juice, I ended up winning the Severed exclusive edition of Back From Hell! 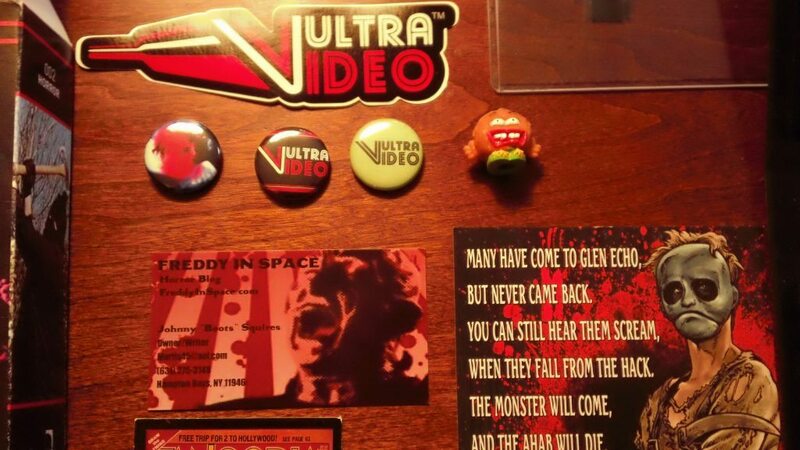 Along with the video (which came with a poster, Vultra Video sticker, and three frames from the movie), John, from Freddy in Space, also added some Vultra Video pins, a couple cards (Before the Mask promo, Freddy in Space card, and Fangoria trivia) and a supremely awesome little rubber monster. I love this little guy! He looks like he might be a pencil topper or something. I don’t know for sure, but I do know he will have a place of glory on my Halloween table this year. The horror gods are no doubt looking after me, their puss filled testicles wrapped firmly around my torso, and barbed appendages clamped around my biceps. They provided this grand offering to fatten me, in preparation of the coming feast. But that’s another story. 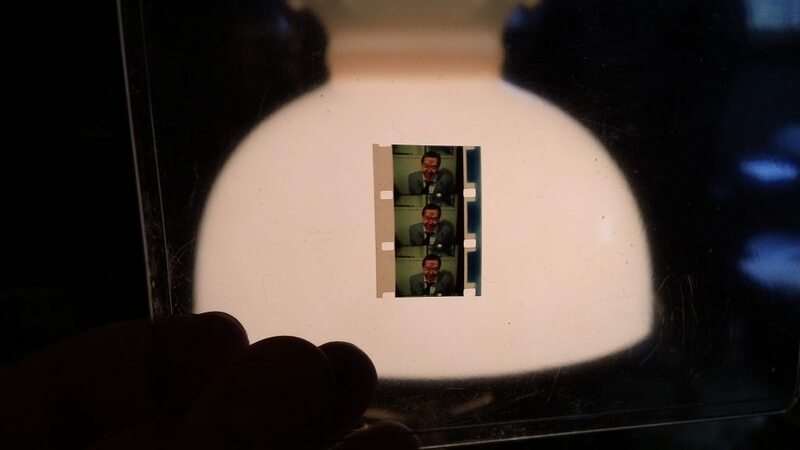 This story has come to an end, and was written only to say this: Thank you John, and thank you everyone at Vultra Video. I will enjoy the hell out of this VHS.